Pulse Digital offer a wide range of solutions which provide comprehensive document management to simplify and automate everyday work activities, helping you to achieve sustainable commercial benefits. Throughout the document process our solutions provide seamless integration of work flow, document access, distribution, security, device management, cost control and document accounting. 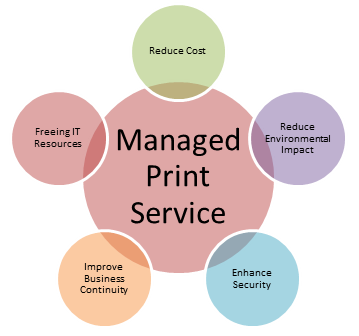 What is "managed print services? Simply its gaining visibility and control of your printing, which helps you save money and boost productivity. No matter what the size of your organisation, managing a print environment comes with a number of challenges. As your business grows so does your printer fleet; making this one of the largest unmanaged expenses in your business. Managed print also helps you improve document security. Pulse Digital understand that you have to protect the confidentiality and security of documents for your staff and customers. Benefit from access control, device authentication and a range of other features to keep documentation secure. Our managed print services means that you and your staff only need to think about replacing the paper that comes out of your devices. Through managed print services, you can outsource print management and cut costs by as much as 30%. Pulse Digital offer a full spectrum of managed print services for everyone from small businesses up to large, multinational corporations. Before signing your MPS contract with Pulse Digital, one of our account managers will conduct a Free Print Audit. This review of your office document printing includes: colour vs mono printing, monthly document volumes, energy use, consumable costs, paper costs, and outsourced printing, as well as the rental/lease costs associated with the equipment. Got multifunction printers? No problem! When you need to manage printing, copying, scanning and faxing, PaperCut™ MF has all the features you will need. PaperCut™ print management benefits businesses by saving on printing costs. This is achieved by tracking employee usage by individual, office or department and providing comprehensive reports on usage costs, budgeting and environmental impacts. With Mobile Print, you can wirelessly scan from and print to compatible printers and MFP's on your local network, from your Android or iOS. It’s easy to install and it’s free. You can print and scan on the move, whether you are in your home, office or at a customers. KYOCERA Mobile Print or OLIVETTI Managed Mobile Print keeps you on the Go! Download the KYOCERA app for your Android or Apple tablet and phone. Students bring their own computers and mobile devices with them to study and solves their printing headaches in minutes! Businesses are unique and the HyPAS platform (Hybrid Platform for Advanced Solutions) from KYOCERA recognises this and provides multiple 'off the shelf' or customised applications to improve document workflow, enhance information sharing and optimise resource time. KYOCERA’s HyPAS platform is unique in that it offers both Java-based and Web Services-based Software Development Kits (SDKs), providing an open and flexible platform. It enables advanced integration of the MFP with solutions that are already implemented in the organisation.